Skinny Powers presents "Phat Sounds"
Skinny Powers, with Bravado, Burn the Witch, Risky Whispers, and Everdeens are going to bring you a night of music on Saturday, September 29th at 1884 Lounge at Minglewood Hall, with proceeds going to ALIVE Rescue Memphis! Sponsored by Buff City Soap, and LOCAL X Radio! Donation for entry, proceeds benefit Alive Rescue Memphis. ALIVE Rescue Memphis is having our first ever Bar Olympics at The Hi Tone Cafe on Sunday December 10th. It will be a Sunday funday of competition, games, drinking, and dogs all to raise money for the current and future dogs of ALIVE Memphis. Registration is available in teams of 4 and 6. All teams will start at Hi Tone to sign-in, collect your scorecard and receive your bar/game schedule for the day. Games include Beer Pong, Wii Bowling, Flippy Cup and so much more! Games begin sharply at 3:30 and each team will head to their first game station and begin their first game. Teams will rotate through their game schedule. Beyond a plethora of fun and competition we will also have pictures with your pups and Santa. This will not be the usual boring and basic Santa. Imagine Santa with a Memphis twist. There will also be a ton of fun raffle prizes to win along with music, food trucks, and a few other fun things up our sleeves. Come spend the afternoon with us and drink and play to your heart's delight while helping us bring in some much needed cash for the dogs who depend on us. We are excited to partner up with getARCHd again this year with their pet portrait holiday ornaments. Order a one of a kind ornament with your pets image on it, and a portion of the proceeds will go to us! These ornaments are custom made and both sanded and stained in a red oak finish. Your pet's photo is transferred onto the ornament and they come to you ready to hang! Each ornament is custom made. Ornament is first sanded and stained in a red oak finish. Photo is then transferred to the wood using a gel medium. Ornament is then distressed by hand and sealed with a protective coating of polyurethane. A hemp string allows for easy hanging. They also offer gift wrapping if you want to purchase this for the pet lover on your holiday list. Head over to their etsy shop at https://www.etsy.com/listing/482525554/pet-photo-custom-christmas-holiday?ref=shop_home_active_1 for details. Come join us and some of our amazing adoptables at Kendra Scott! They will be donating 20% of their proceeds during this time straight to ALIVE Rescue Memphis!! This is a fantastic opportunity to support your favorite rescue, all while getting some holiday shopping done, or just doing some shopping for yourself! Kendra Scott will also be providing drinks and sweets for guests to enjoy! Join us and get your glitter on!! Join us Tuesday October 3rd at 7pm for a P&H Trivia Tuesday revival night! We've recruited all of your favorite trivia hosts from back in the day, and for just $10 in advance ($12 at the door) you will get trivia, a raffle ticket, a koozie and whole lot of fun! We will have fantastic prizes for 1st, 2nd and 3rd place winners, as well additional raffle prizes throughout the night. It promises to be a fun filled evening full of wit and wisdom! As usual, every dollar we make will go directly toward continuing to provide outstanding care for our rescue animals. Just in case you are new to P&H Trivia, there are just a couple of rules to review. Teams can be anywhere from 1-6 players. There will be 5 rounds of 12 questions each. Winning prizes will go to 1st, 2nd and 3rd place teams. Be sure to RSVP before the event, so you don't miss your chance to get in on the sweet, sweet trivia action! We look forward to seeing you there! Grrrls Night! A night of Beauty and Fun!! Our favorite fundraiser is back! Come early, hungry, thirsty, with a crew of girlfriends, and get ready to have a night you will not forget. Join us Tuesday March 28th at 7pm for a P&H Trivia Tuesday revival night! We've recruited all of your favorite trivia hosts from back in the day, and for just $10 in advance ($12 at the door) you will get trivia, a raffle ticket, a koozie, and whole lot of fun! We will have fantastic prizes for 1st, 2nd and 3rd place winners, as well additional raffle prizes throughout the night. It promises to be a fun filled evening full of wit and wisdom!!! As usual, every dollar we make will go directly toward continuing to provide outstanding care for our rescue animals. Just in case you are new to P&H Trivia, there are just a couple of rules to review. Teams can be anywhere from 1-6 players. There will be 5 rounds of 12 questions each. Prizes will be awarded to the 1st, 2nd and 3rd place teams. 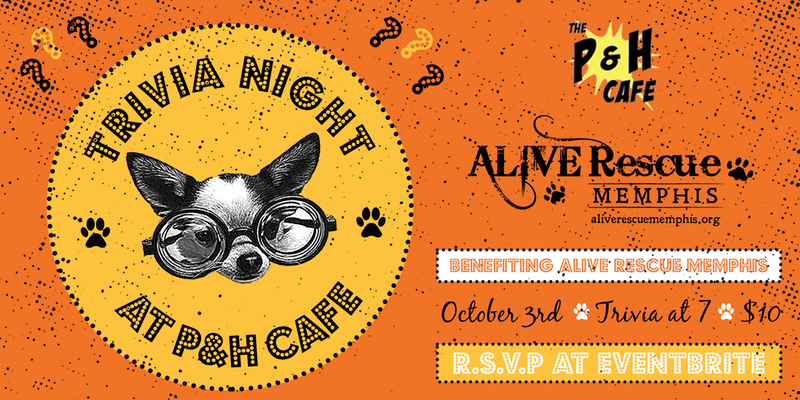 Be sure to go to https://www.eventbrite.com/e/trivia-night-alive-rescue-memphis-tickets-32608883047 to RSVP before the event, so you get the discount, and you don't miss your chance to get in on the sweet, sweet trivia action! We look forward to seeing you there! 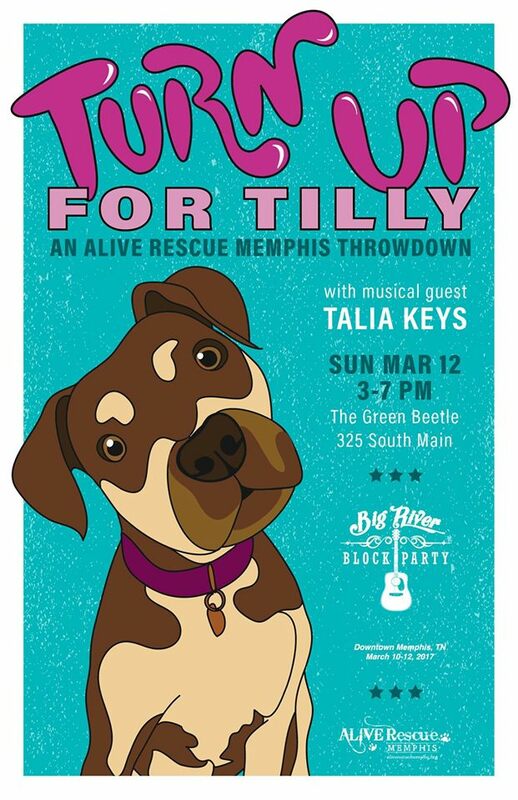 Meet us March 12th from 3pm-7pm at the Green Beetle (325 S. Main) to Turn Up For Tilly! This wonderful dog came to our program with severe heartworms and is going to require a ton of work to get her healthy and adoptable. We are happy to do it and decided a celebration of her is the best way to make it happen! We are super thankful to have the talented Talia Keys playing music at our event to get Tilly ready for her FOREVER HOME! $6 admission gets you a Yazoo beer and a raffle ticket. We will have awesome raffle prizes available and additional tickets for sale. Check out our table while you are there for new ALIVE Rescue Memphis merchandise. Adoptable pups will be there and other leashed, friendly dogs are welcome in the outdoor area. Tilly will be present, bedazzled, and maybe can be talked into signing autographs and taking selfies! See you there!!! The second annual Memphis Grilled Cheese Festival will take place December 11th, 2016, from 12-6 pm at Hi Tone in Memphis, TN, benefiting ALIVE Rescue Memphis. This is Memphis's first grilled cheese festival. People love grilled cheese, so let's have a cook-off to see who has the most cheesiest, most ridiculous, and of course, best tomato soup! This event is open to the public as they are an important part to the best category, fan favorite. With a general admission ticket ($5), you will have access to Memphis Grilled Cheese Festival. Each team will be handing out samples during the cook off in hopes to win your vote. There will be a box on the table of each team where you can give a donation (of any amount) and the team with the most donations will be awarded Fan Favorite. These aren't donations to that team; these donations will go directly to ALIVE Memphis Rescue and its adoptable pups. Hi Tone will also be open will live music, two bars, and a grilled cheese eating competition. Hope to see ya there! Please join us Saturday, November 19th at 5585 Walnut Grove Road. 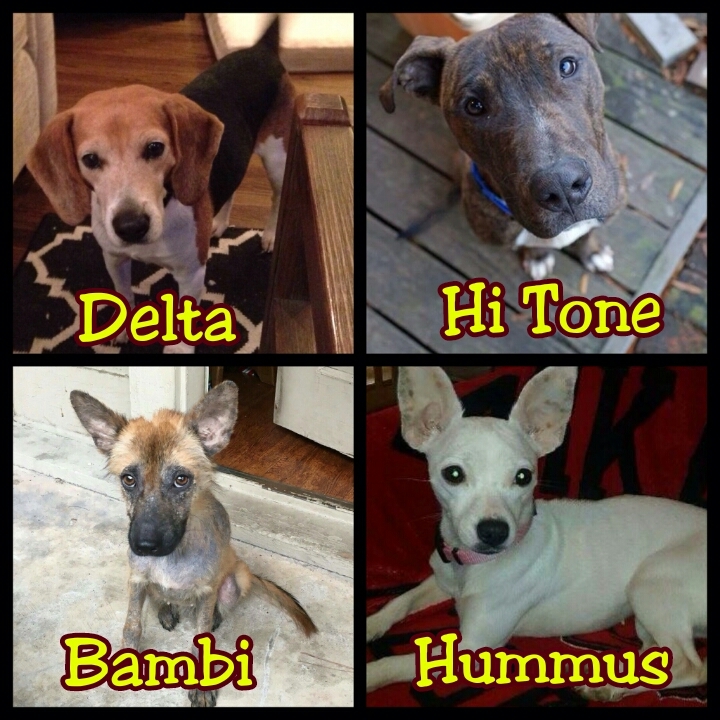 $15 goes towards drinkies for you and supports our Delta Fund for animals in need. We are pumped to have another event at The Green Beetle. On September 4th from 3-7 we will be hosting Barks For Bucks. Come out and enjoy the music of The Rusty Pieces, adult beverages, and our dogs.All the money raised will go directly to the dogs in our program. $6 admission includes your first Yazoo Beer and a raffle ticket! We will also have a raffle with a ton of cool dog and people related prizes. We hope to see you there! Join us for a four-legged-friendly event for dogs and their faithful owners! Enter to win prizes for best trick, most fitting name, and best costume. Keep cool all afternoon in the Hot Diggity Dog Kiddie Pool Area. Connect with Memphis' best resources for raising a happy, healthy pup at our Doggie Expo. Tickets at the gate. MBG members $5/non-members $10. Visitmemphisbotanicgarden.com/dogday for information. On Thursday June 9th from 6pm-9pm we will be celebrating rescue, fashion, and cruelty free beauty at Stock & Belle. For only $20 dollars you get cocktails and appetizers to enjoy while shopping this adorable store. There will be professionals on hand to make your hair, nails and make-up look amazing with products that are 100% cruelty free. A photographer will be ready to snap photos of you before and after your transformation. We will also have some amazing items up for raffle. The first 30 girls who make it through the door will get cruelty free gift bags full of awesome products. Please come out and support ALIVE Memphis, while being beautiful and cruelty free. Join us in the Outback Off-Leash Dog Park for Shelby Farms Park Conservancy's most pawsome event: Dog-A-Roo! This pup-friendly festival offers a wide range of actives for your furry friend, including a talent + costume contest, rescue parades, the Four-legged 4K Fun Run, gourmet pet treats, pet specialist information sessions and more! Pre-registered Four-legged 4K participants park for free! We are so excited to be partnering with Pet Your Shirt through the month of April to raise money for ALIVE Rescue Memphis and to provide all of you with the opportunity to put your pet on your shirt! That's right folks! Pet your Shirt takes the likeness of your pet and puts them on a shirt for you so you can have your pet with you all day long. Want to show off your amazing relationship even more? Get your dog a shirt with a picture of your face on it. We kid you not! Also check out the options of getting a tote bag, sweatshirts and more! During the month of April, if you select ALIVE Rescue Memphis as your rescue of choice, we will receive 10% of your purchase! This money will go towards ALIVE Rescue animals! • After payment is complete, a form will pop-up asking you to upload your pets’ photos. Get a great a shirt of your favorite family member and help us rescue more animals. It's a win win! Thank you times a million to Angela Pieroni and her awesome Blankets For Barks drive. She literally packed the rescue mobile full of blankets, dog beds, and toys for our ALIVE Memphis dogs in foster care. We love you Angie and your huge heart always amazes us! ALIVE Rescue Memphis is having our first annual HOMECOMING PARTY to celebrate dogs who we have adopted out since our inception! We will have food & drinks (of the adult variety) on hand. The first 30 attendees will leave with a goody bag for themselves and their pets. We will also have a raffle with prizes that are people and dog friendly. There will be outdoor and indoor play for all dogs that attend. Little dogs will be in their own play area. If the weather is nice, we will have swimming pools for the dogs to cool off in. We will also have a photgrapher present, so you can get a photograph with your adopted or foster pup. Cost: $10.00 Suggested Donation per person (pups are free). 2nd annual Green Beetle event benefiting Alive Rescue Memphis. This time we are celebrating our "Throw Me a Bone Project." All funds from this project are used solely to help pets and pet owners who need supplies or money for vet bills. In this way we hope to decrease the number of people surrendering their pets to KILL SHELTERS in the Memphis and West Memphis area. The first annual Memphis Grilled Cheese Festival will take place December 13th, 2015 from 12-6pm at Hi Tone in Memphis, TN benefiting ALIVE Memphis Rescue. This is Memphis's first grilled cheese festival. People love grilled cheese, so lets have a cook off to see who has the most cheesiest, most ridiculous and of course best tomato soup! This event is open to the public as they are an important part to the best category, fan favorite. With a general admission ticket ($5), you will have access to Memphis Grilled Cheese Festival. Each team will be handing out samples during the cook off in hopes to win your vote. There will be a box on the table of each team where you can give a donation (of any amount) and the team with the most donations will be awarded Fan Favorite. These aren't donations to that team, these donations will go directly to ALIVE Memphis Rescue and their adoptable pups. Hi Tone will also be open will live music, two bars and a grilled cheese eating competition. Hope to see ya there! Join us December 5th from 6pm-9pm at Stock & Belle, for our second annual Art For Barks fundraiser. This event will include a live art auction with artwork from many talented local artists. We will also have a silent auction and music. The price for admission is $20, which includes food, cocktails, & beer. Details on ticket sales coming soon. RSVP now! The turnout last year was amazing and you won't want to miss this event. We would love to see you there! It will be a wonderful night full of art & fun all while celebrating the sucess of ALIVE Rescue Memphis. Come out and help us continue to save lives of needy animals in the south! Come join us October 15th at Celtic Crossing for a fun night of bingo all to raise money for ALIVE Rescue Memphis. We are delighted to have Freak Nasty calling out bingo numbers and there will be amazing prizes to win by local Memphis businesses. This is a dog friendly event. Show up for the rescue and stay for the prizes, belly rubs and amazing performances. We hope to see you there! Tickets to play all ten games start at only $10. ALIVE Rescue Memphis will also have t-shirts for sale as well as adoptable dogs there giving tail wags between games.